This coloring activity is suitable for beginning biology students who are learning about the plants and animals found in each major biome. 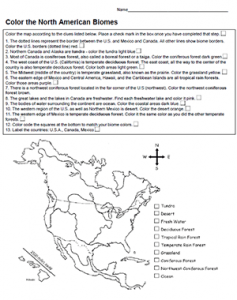 The worksheet does require a basic geography knowledge, which I found somewhat lacking in my freshman students. I usually place a large map of North America on the overhead projector for students to reference to help them color the biome map. The map gives clues about the location of each biome and requires students to color the regions a specific color. Biomes represented are: temperate deciduous forest, grassland, desert, tundra, rain forest, coniferous forest, freshwater, and ocean. Questions at the end of the activity ask students to identify where major biomes are located and which biomes you would pass through if you were travelling from one area to another, for example, travelling from Los Angeles to Washington D.C.
A final question asks students to color a world map. This might be too time consuming for what students are likely to learn, though might be a good extra credit exercise or just a point for class discussion. For example, students may notice that the deciduous forests are all found at about the same latitudes.